A couple of plaques and a street name hardly suffice when it comes to remembering the greatest composer in history. Which is why Vienna has more than a few monuments dedicated to the genius of Mozart. The biggest now sits in the Burggarten park that borders the Hofburg Palace. The Mozart monument started life in 1896 in front of the Albertina palace, where it suffered bomb damage during the last days of WWII. After repairs, it relocated to the Burggarten park in 1953. The park itself owes its existence to the deprivations of war, having been built as part of the clear up following the withdrawal of Napoleon’s troops in 1809 (silver linings, etc.). 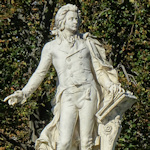 Mozart’s statue looks out from the top of the monument, one hand turning over the sheet music on the stand next to him. He makes an ideal perch for pigeons, perhaps allowing them to exact revenge for having a birdcatcher as the star character in The Magic Flute. The front relief depicts two scenes from Mozart’s opera, Don Giovanni. The rear shows him as a young child performing with his father and sister, based on a watercolour by Louis de Carmontelle. At the right time of year, a perfect bed of flowers spells out a treble clef on the ground in front of the statue. Karl König (architect) and Viktor Tilgner (sculptor) were the men behind the monument’s design. König is perhaps most famous for the Haus der Industrie on Schwarzenbergplatz, officially opened in 1911 and still home to the Federation of Austrian Industries. The Emperor of the time, Franz Joseph, looked favourably on Tilgner’s creative output, and Imperial approval opened a lot of doors in those days. The sculptor’s busts of playwrights grace the Burgtheater, his statues such iconic buildings as the museums of art history and natural history, or the Hermesvilla (Empress Elisabeth’s summer house). The monument sits just inside the entrance to the Burggarten that leads off the great Ring boulevard, so you can see it as you drive (or ride) past. Subway: take the U2 line to the Museumsquartier station. Tram: the Burgring stop is just outside the park entrance and reachable by tram lines 1, 2, 71 and D.
Bus: the 57A bus also stops at Burgring.